NEW YORK, N.Y. -- Army National Guard leaders came together to honor a New York Soldier who died in a massive fire in the Bronx on Dec. 28, 2017, with the Army's highest award for bravery outside of a combat zone. Pfc. Emmanuel Mensah, the Soldier who died in a massive apartment house fire, posthumously received two medals for valor in a ceremony for the family on Feb. 16 at Fordham University in the Bronx. Mensah is credited with saving four lives, rescuing people three times before he returned to the building and did not come out. 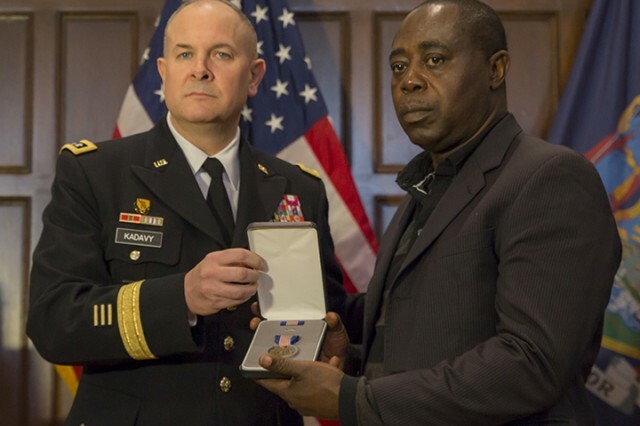 Lt. Gen. Thomas Kadavy, director of the Army National Guard, presented the Army's Soldier's Medal to Kwabena Mensah, father of Emmanuel Mensah. "Difficult though it may be," Kadavy said, "please think of this ceremony as an opportunity not to mourn, but to celebrate Private First Class Mensah, an unselfish Soldier of incredible bravery, who sacrificed his own life to save several others, and while attempting to save more." Secretary of the Army Mark T. Esper approved the posthumous award of The Soldier's Medal for Pfc. Mensah on Jan. 1, 2018. "The Soldier's Medal is an award that no one sets out to receive," Kadavy said. "If any of us could change the circumstances that bring us together this morning, we certainly would do so." Thirteen New York City residents died in the fire. Fire department investigators say the blaze was started by a young boy playing with a gas stove. The fire spread after the child's family escaped the apartment and neglected to close the apartment door behind them, according to investigators. "After quickly escaping the fire, Private First Class Mensah could have remained safely outside," Kadavy said. "But, knowing that residents were still inside, it was not in his nature to stand by without doing whatever he could to help them escape the deadly inferno that was raging through their homes." When firefighters were able to enter the building, they discovered Mensah's remains and believe that based on the location of the body, he was still seeking to rescue people, according to statements provided to New York Army National Guard officials. The family of Emmanuel Mensah says his son's lifelong dream was to join the military. "He fulfilled his dream, what he wanted to do," Kwabena Mensah said. "He was proud of being (in) the American military. He was so proud of that." 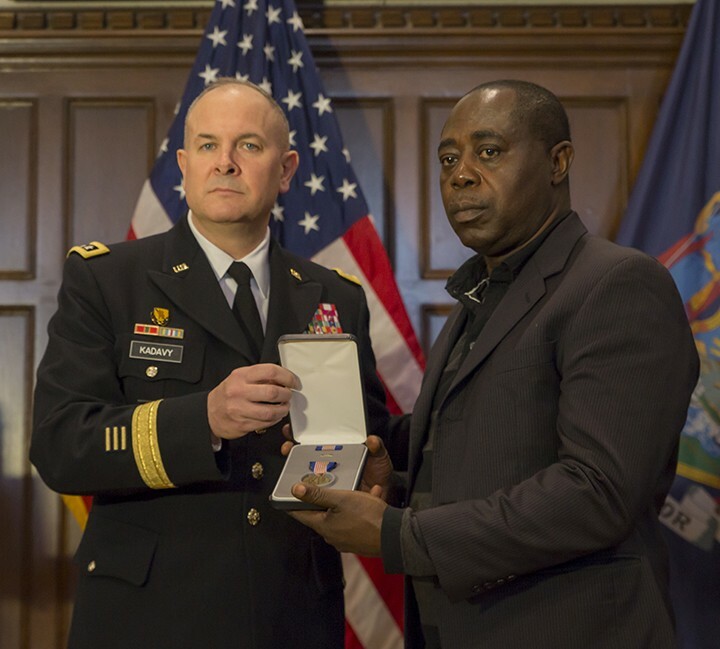 Richard White, New York State's deputy secretary for public safety, additionally presented the New York State Medal for Valor to the Mensah family on behalf of Gov. Andrew M. Cuomo. His family immigrated to the United States from Ghana and Mensah was a permanent legal resident. He became a naturalized citizen on Sept. 21, 2017. "He came to exemplify what is best about his adopted country and Ghana, his country of origin," White said. "What that means is that when others would run from the inferno, our Pfc. Mensah ran into the blaze." "It's given we, the family members, some peace and some joy and hope that even though we have lost him physically, his memory still lives on," Gloria Addo Nuamah, his sister, said. "People will remember him for this bravery and that's what this ceremony stands for me." He was slated to begin drilling with the New York Army National Guard's 107th Military Police Company at Fort Hamilton in Brooklyn in January 2018. Mensah was still assigned to Company A of the New York Army National Guard's Recruiting and Retention Battalion prior to joining the 107th MP Company. Pfc. Mensah was buried with full military honors Feb. 17, 2018, at Woodlawn Cemetery in the Bronx. "Every Soldier has a story," Lugo said, "this just goes to show how all of our Soldiers are special."